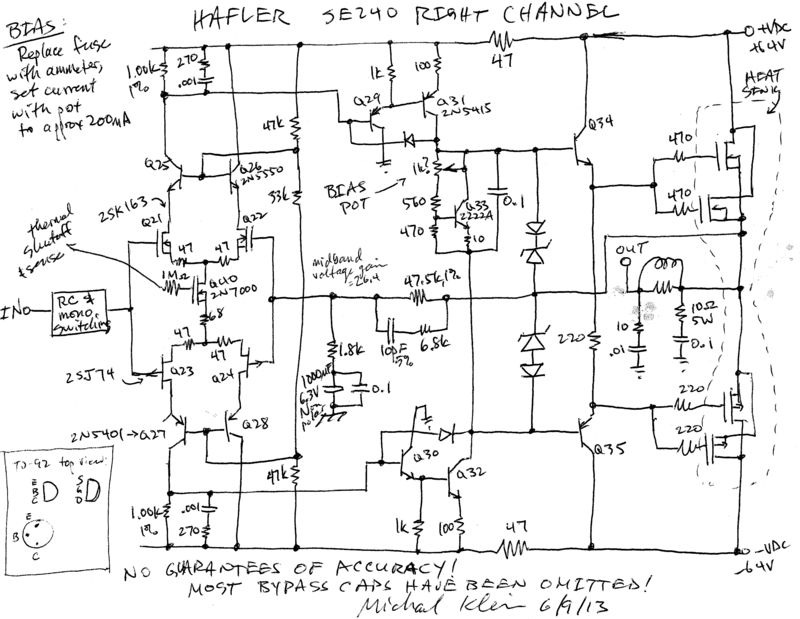 For the hordes of Hafler fans out there dying to get a schematic diagram of the SE240 power amplifier, here it is. This schematic is (obviously) hand drawn based on reverse engineering the circuit board. It shows only the key parts (active signal path) of the right channel, but it’s most of the components of the channel. Input switching and RC network is not shown, and most supply bypass caps are not shown (there aren’t many). All elements of the signal path are shown. While a few sources found in web searches indicate that the SE240’s circuit is similar to the DH220 kit, which has schematics easily available, it is only partly so. There are quite a few important differences, such as an all-FET input stage with cascode isolation, thermal sensing, input stage switching to support bridged mode operation, and no speaker fuse. I drew this schematic to diagnose a massive overheating problem which appeared to be due to uncontrolled oscillations (the 10 ohm 5 watt resistor in the speaker output path was smoked). I thought the cause would be a cap in the feedback loop having gone bad, causing loop gain at 180 degree phase to be above 1. In the end, it wasn’t any such cause; it appears that simply having disconnected the power connector and the fuses restored the amp to perfect working order, and it sounds fabulous again. All FET input stage: MOSFET to drive the positive rail, JFET to drive the negative rail. Unfortunately specs for the MOSFETs (2SK163) appear to be impossible to find. Adjust the bias pot so the ammeter reads 200 mA (I am guessing at this value; I’ve seen people describe settings between 150 and nearly 300 mA). At 200 mA the amp dissipates 26 watts in quiescent mode, which gets it nice and warm but not hot. I also ordered a set of replacement capacitors for the signal path and bypass caps from Mouser Electronics where I was pleasantly surprised to find all items in stock and at quite good prices, even including Nichicon capacitors. Note the original capacitors are polycarbonate film which is for all practical purposes no longer available (discontinued in 2000), and a good replacement for audio applications is polypropylene film. The complete set cost under $30 including shipping. Does the Mac Measure Up for Intensive Business Use?